Patriots WR Josh Gordon will reportedly be suspended, again, for a drug policy violation, again. It’ll be the I’ve-lost-countth suspension of Gordon’s career, which began way back in 2012 but because of all the time missed has amounted to just 52 total games played, and just 22 since he made the Pro Bowl in 2013. Gordon was and is talented, but he just hasn’t been able to stay on the field, and he’s probably run out of teams willing to give him the chance. That the Patriots got Gordon so cheaply was a reflection of the risk he was perceived by teams to carry: New England gave up only a fifth-round pick to get Gordon and a seventh-round pick from the Browns, who had already announced their intentions to cut Gordon. That small haul, despite the fact that Gordon is still on his rookie contract, was a bad sign. 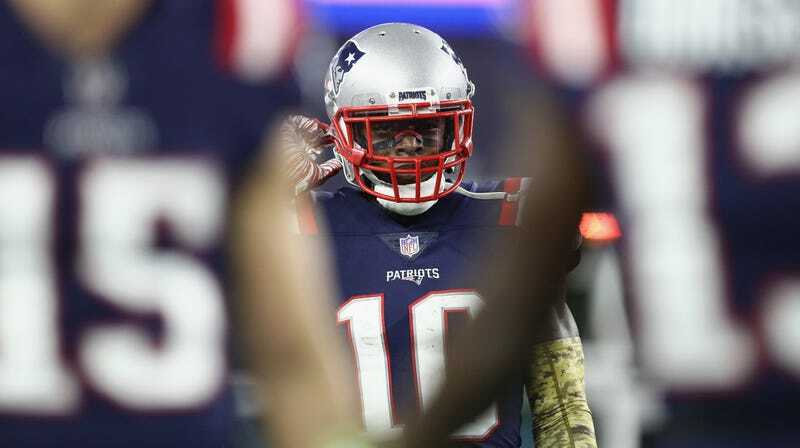 Gordon has been relatively quiet since joining the Patriots in September, catching 40 balls for 720 yards and three scores in 11 games, but quiet seemed like a good thing; if we weren’t hearing about him, maybe he had mastered some of the problems he’d faced, including substance abuse and mental health issues. Not so, apparently. Gordon got the jump on the suspension news this morning, tweeting out a statement that he is stepping away from football for a while. It was not entirely by choice, as we now know. The NFL should not test for recreational drugs, especially marijuana. But it does, and Gordon knows it does, and the fact that he’s been unable to meet the (relatively low) standards for avoiding getting popped by the league’s drug testing is a sign he’s got real problems. He’s admitted as such. And, of course, there’s often no untangling addiction from mental health. Gordon’s still only 27 years old. I hope he gets healthy and happy. Donald Trump Has To Give Up Autographed Tim Tebow Gear He Bought With Charity Money. Sad!